Nvidia has recently released a new card in its GeForce 10 series which is GeForce GTX 1050 3GB. This card is an upgrade over the standard GTX 1050 that has got 2GB of VRAM. The new card has its place in between GTX 1050 2GB and the GTX 1050 Ti, which is a very popular & powerful mid-range graphics card and has got 4GB of Video memory. The launch of this new 3GB GTX 1050 created a lot of confusion because the performance of this card is closely matched to both of its siblings i.e. GTX 1050 and GTX 1050 Ti. So, to clear the things out here I am going to compare all three of these graphics cards and share my opinion on them. This will help you to make an informed decision on which card to get for your gaming or work needs. 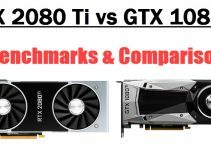 Here is the comparison of 3GB GTX 1050, 2GB GTX 1050 and GTX 1050 Ti graphics cards based on their specifications, performance, power consumption and pricing. GTX 1050 2GB comes with 640 CUDA Cores with base / boost clock speed of 1354 / 1455 MHz and the 3GB variant comes with 768 CUDA Cores with base / boost clock of 1392 / 1518 MHz, while the GTX 1050 Ti also has 768 CUDA Cores but lower clock speed of 1290 / 1392 MHz. 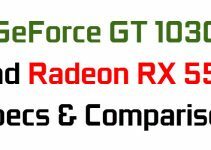 In terms of GPU power or configuration we can see that 3GB GTX 1050 has the best specs and also has the highest GPU clock speed. But a slight boost in clock speed alone does not result in higher performance because we have to take in account of other factors too such as memory size and configuration which I will discuss next. What clearly sets all these three cards apart is the memory configuration. The 2GB GTX 1050 comes with 2GB GDDR5 memory (128-bit) @ 7GHz offering memory bandwidth of 112 GB/s. The newer 3GB GTX 1050 comes with 3GB GDDR5 memory (92-bit) @ 7GHz offering bandwidth of 84 GB/s. The GTX 1050 Ti has the best memory configuration with 4GB GDDR5 memory (128-bit) @ 7GHz and bandwidth of 112 GB/s. Here we can see that while he newer GTX 1050 has 1GB increment in memory size over older GTX 1050 but it suffered loss in the memory bandwidth department because the memory bus width has been cut down to 96-bit from 128-bit. This can affect the overall performance of the card especially in high-end games with heavy textures. Yes, you may benefit from the extra 1GB memory but it won’t given you that much of benefit if the memory is slow to perform. Also, the card also has only 24 ROPs compared to 32 ROPs in the other two cards. On the other hand, GTX 1050 Ti has the best memory figures and is more future proof than the other two cards. The 4GB VRAM is enough for playing latest games at high graphics settings at 1080p resolution. All these three graphics cards offer same features and API support for games. They all support DirectX 12, OpenGL 4.5 Vulkan, Nvidia G-Sync, Nvidia Ansel, Nvidia GPU Boost, NVIDIA GameStream and Windows 7-10, Linux, FreeBSDx86 operating systems. 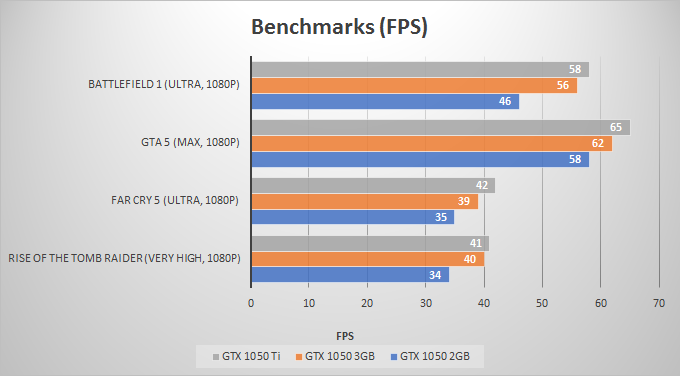 Below are the benchmarks of these three graphics cards in different games. From the above gaming benchmarks, we can see that the performance of 3GB GTX 1050 lies in between the 2GB GTX 1050 and GTX 1050 Ti. In some cases, it is as fast as the GTX 1050 Ti with only couple of FPS short. The card does perform very good and it matches more closely against the GTX 1050 Ti rather than GTX 1050 2GB, but the extra VRAM and higher bandwidth of GTX 1050 Ti will help you in latest upcoming AAA titles. All these graphics cards have similar power consumption and none of them require external PCIe power connectors from the PSU. The power consumption of these graphics cards is rated at 75 Watts and they require a good 300W PSU for their working. However, in real world 3GB GTX 1050 consumes a bit more power compared and draws more current from PCI-E slot compared to the other too. This is quite strange but it is not of any major worry as of now. The cheapest of them is the 2GB GTX 1050 while GTX 1050 Ti is the costliest of all. 3GB GTX 1050 sits in between these two cards and is close to the pricing of 2GB GTX 1050. The latest card i.e. 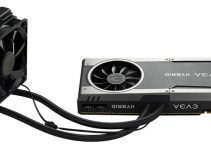 3GB GTX 1050 may be a bit difficult to find because it is a newer card. 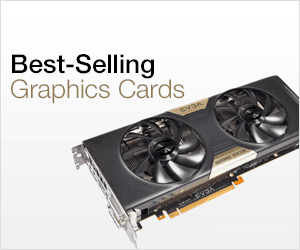 However, the other two cards are readily available from different graphics card manufacturers. You can check the current pricing of all these three cards from the links given below. 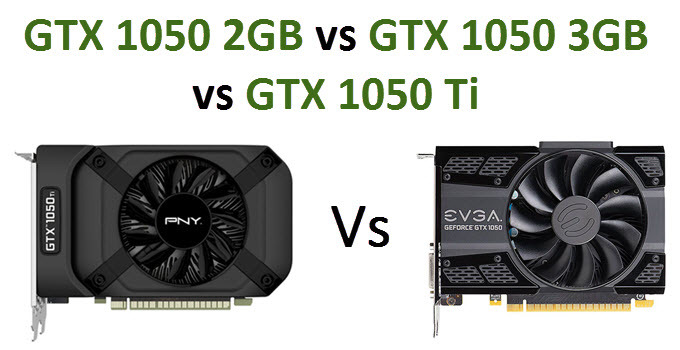 There is no doubt that all these three cards are great for 1080p gaming on budget. They are powerful enough to run latest games at high to very high settings with comfortable frame rates. The launch of 3GB GTX 1050 is really a surprise because the card offers very little performance gain over 2GB GTX 1050 and it still lags behind the GTX 1050 Ti. It may not be a worthy upgrade over the 2GB GTX 1050 but that extra 1GB of Video memory may help in latest games with lots of textures. If I were given a choice then I would choose GeForce GTX 1050 Ti any day if budget is not that much of a issue, and when I am on tight budget then 3GB GTX 1050 would be a good choice only if it is priced same as the 2GB GTX 1050 or is 5 or may be 10 dollars costlier than 2GB one, otherwise 2GB GTX 1050 is good to go. You can also say that 3GB GTX 1050 is a cut down version of GTX 1050 Ti and a beefed up model of 2GB GTX 1050. My Pick: GTX 1050 Ti for Performance and GTX 1050 3GB when on tight budget (only when it is priced almost same as GTX 1050 2GB).